If you couldn’t tell, I’m more than a little obsessed with this project. I would say the main reason is because it was all my hubby up to this point. He dug the pallets out of the snow, loaded them up into the truck, broke them down, cleaned them off and started piecing it all together. Then he went out of town for a couple days for work and I was left to sit and wonder what it would look like finished. I began thinking thoughts like: I could use a saw, right? I could figure out a nail gun. Honestly, how hard could using a stud finder be? 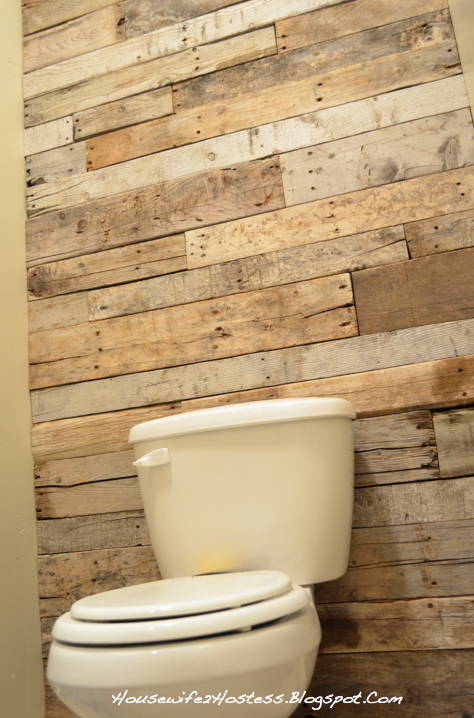 So many youtube tutorials later (the most embarrassing one being: “How to unlock my saw”) I turned a plain bathroom wall into my DIY masterpiece! I’m not sure if that was a compliment, but I’m totally taking it as a HUGE compliment. I love how I was able to finish this project all by myself! FYI: I wanted to show the wall with pictures taken using a DSLR camera. I feel like this is the best photo so far, to the true coloring of the pallets. Click here to see the pallet before photos. 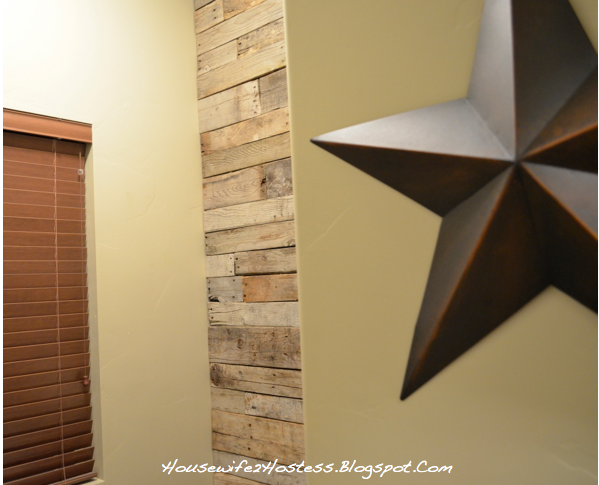 are the pallet pieces that you used different widths as well? its hard to tell. i’ve been thinking of doing this with thinner and thicker pallet pieces but not sure of the look. Yes they were all different. Even the thickness of each board was, some of them stick out a 1/2 inch further than each other (from the wall). How did your husband clean off the pallets? Did you stain them or seal them? Did you put sheer wall or a board on the wall before you started putting up the pallet pieces? We didn’t seal them we just painted the wall a flat black before nailing them in! I hope this was helpful. 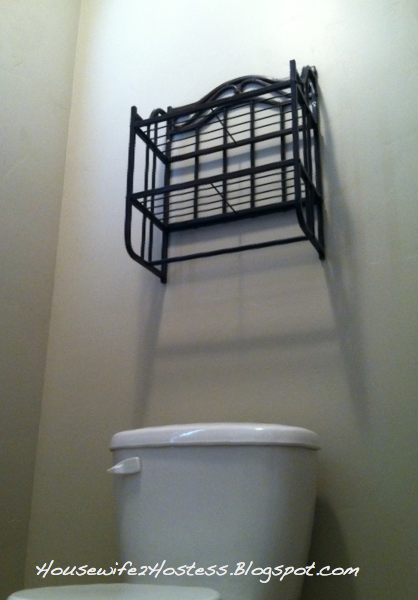 I am *attempting* to do this project over the next few days for my VERY small half bathroom that has NO window. What color would you recommend painting the other 3 walls to bring out the colors in the wood and to make the bathroom not look so dinghy? Thanks for your help and the tutorial. Fingers crossed it comes out like yours! Tara…in a small bathroom with no windows, the other three walls painted white or a similar bright color would, in addition to brightening the room from the lighting you have, it would reflect light onto the wood to ‘show’ off the color/shading of the wood. Good luck with your project. I so want to do this in my basement bathroom/laundry room. 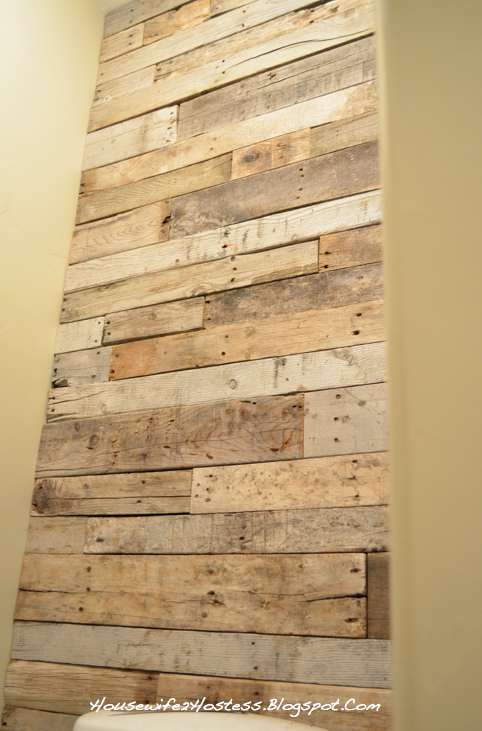 Do you think I could do this over old paneling? Thanks for the pics so I can share with my hubby. 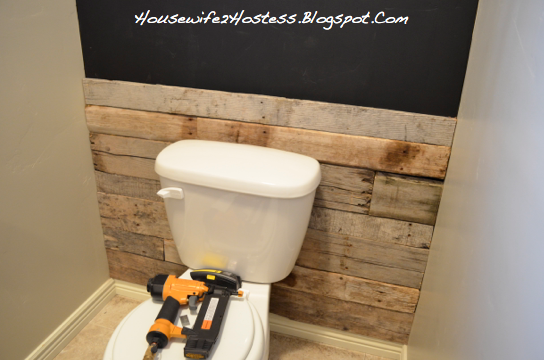 I bet you could do this right over the old paneling! I would just paint the old stuff black underneath! Hi I really ,Ike this idea and will d it in my own toilet too. Did you remove the toilet or just worked around it? Thank you so much! I didn’t have to move it because there was enough room behind my toilet. Love this treatment and I can’t wait to use it a renovation project I am doing right now! How exciting! I’d love to see how it turns out!!! Share a link once you finish! Where do you get pallets? I love this project but have no idea where to get them. These were from my in-laws house in Idaho, but I bet you could find free ones on craigslist.